Let's talk "Oscar bait." If you don't know what the term means. Let me refresh you. "Oscar bait" is a label given to a movie that appears to be made, marketed, and hyped as being of a quality greater than its peers and worthy of multiple Academy Awards. More often than not, "Oscar bait" films are either historical or costume dramas, biographies, or esteemed literary adaptations, which are exactly the type of pedigree that wins awards. Think "Shakespeare in Love" beating out "Saving Private Ryan." In most cases, the project in question has attracted a high-minded director, writer, or both. Furthermore, the film has likely been filled with a cast blending solid character actors with sparkling reputations with a few well-regarded leads that the general public, not just the art house crowd, would be interested in seeing. Lastly, and along those same lines, here's the kicker. The film has a focused marketing machine blueprint behind it that knows exactly how to package and present it to cinema aficionados and general audiences alike. The classic "Oscar bait" film earns its initial buzz and reputation working the top-shelf film festival circuit, weaving through places like Sundance, Telluride, Cannes, Tribeca, New York, or Toronto. After those debuts and premieres, the promoters let the critics and awards it wins do the rest of the talking. The last time this website talked extensively about the topic of "Oscar bait" was in reviewing "The King's Speech" in 2011, the eventual Academy Award winner for Best Picture that year. Within the industry, no one does "Oscar bait" better (and more cutthroat) than producers Bob and Harvey Weinstein of The Weinstein Company. In their stewardship of their namesake label and Miramax Films before that, the brother team has produced or co-produced films that have earned 75 total Academy Awards from 303 nominations, including six Best Picture winners since 1996 ("The English Patient," "Shakespeare in Love," "Chicago," "No Country for Old Men," "The King's Speech," and "The Artist"). The voracious hype and campaigning you sometimes read about is real and it works. Here's the catch. The film being labeled as "Oscar bait" has to be not just good, but great, in the first place. If not, the blueprinted steps of awards hype are just smoke being blown up certain places and the film rubs people the wrong way. The marketing can and has helped "good" films look "great" when they really aren't. Sometimes, it's putting makeup on a pig. However, when you've got a great film and a potential classic, now you're putting makeup on something that's already beautiful. You go from beautiful to stunning and gorgeous. When the "Oscar bait" film itself is worthy, it then rightfully earns the acclaim, buzz, and anticipation being sent its way. This year, the annual Weinstein push will be given to "The Imitation Game." The film checks all of those boxes of "Oscar bait" qualities. You have a war-time period story of great significance, a central biographical figure, and a top-notch cast of revered pedigree. Most important of all, "The Imitation Game" checks the box about being worthy in the first place. The film is tailor-made for awards season and borders on greatness. "The Imitation Game" is better than "The King's Speech" from three years ago and deserves every single over-indulgent and self-glorifying piece of shameless Oscar campaigning that it is going to put out there. This one is worth the hype, folks. Benedict Cumberbatch, the hottest name in Hollywood right now, stars as the influential genius and pioneer Alan Turing. For much of his life, he was an awkward and direct man with his prodigy-level intelligence and impatience who came across as cocky, yet non-political. Towards the beginning of Britain's involvement in World War II in 1939, Turing is recruited by Major General Stewart Menzies (professional movie villain Mark Strong, playing a hero, albeit a sketchy one, for a change), an MI6 spook, to join a special top secret war effort project. Turing joins a team of fellow intellectuals composed of mathematicians, linguists, professors, and even chess champions (played by the likes of Matthew Goode, Allen Leech, and Matthew Beard) who are placed in the charge of Commander Alistair Denniston (Charles Dance) of the British Empire at the Government Code and Cypher School in Bletchley Park. Their secret task was daunting and staggering in its urgency and complexity. The goal of Turing's team was the decipher and crack the Enigma code machine that was used by the Germans to send and receive encrypted messages across the enemy wires. The Enigma code machine was capable of 159 million million (that's 18 zeros, in case you lost count) settings and permutations. Making the challenge even more difficult, the Enigma was reset at midnight each day and the first coded communication came at 6am every morning. That left the remaining 18 hours each day for the team to work on the new permutations looking for the pattern or key to crack it. Once the clock struck midnight, all of their work would fail and they would be back to new calculations starting at 6am. While the rest of the team tinkered on paper with the voluminous equations, Turing sought the planning and resources to develop his own electrically-powered computation machine that could calculate the millions of permutations faster than one man or a team could on paper. Alan's selfish work alienates the rest of the team, so he seeks out and interviews new help in the form of the unmarried student Joan Clarke (Kiera Knightley), whose untrained skill with puzzles and math nearly matches Alan's. Turing's vision and creation, known as a "bombe," became the precursor to the world's first computer. Behind the scenes of this meticulous challenge, we begin to learn great depths about the man of Alan Turing himself. On the outside, he was characterized as the cold and conceited intellectual. On the inside, he was a passionate thinker and a closeted homosexual in a time where such "indecency" was illegal in the United Kingdom with criminal sentencing ranging from chemical castration to imprisonment. Exposure of this secret could ruin his university career and devalue his immensely important and groundbreaking work. As the film progresses, flashbacks to his youth schooling in the 1920's and a future flash-forward to a 1951 robbery and future arrest break up the film's war-time focus and offer rich details that reflect the full scope of this man's life and journey. 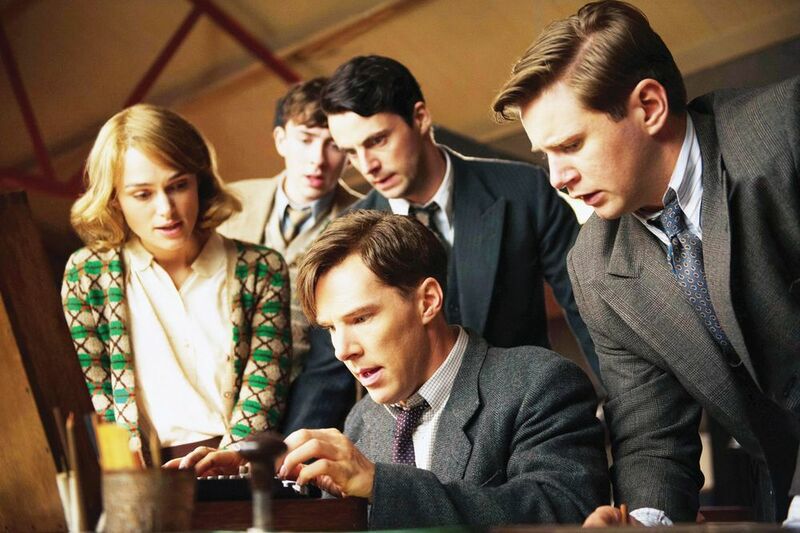 "The Imitation Game" is as polished a film as you will see this year. Some will call that a negative quality, but I do not. Some think polish means that a true story is getting the "Hollywood treatment" and is being dramatized and pumped up to a high degree where the truth is given more sparkle than validity. As with any true story and historical film, I encourage viewers to do their homework either before or after the film (or both) before placing judgment and poking holes. In that regard, "The Imitation Game" holds far more water than "Lee Daniels' The Butler" and other recent historical epics. That also includes 2001's overly melodramatic and highly fictionalized "Enigma," directed by Michael Apted and written by Tom Stoppard, which stands as the only other feature film that attempted to tell the Bletchley Park codebreaker story. It starred Dougray Scott and Kate Winslet and didn't even acknowledge, portray, or mention Alan Turning, the real codebreaker. There are spoilers there, but your homework will show you a fascinating central figure that deserved this level of importance. You will find a film that didn't shy away from a man's flaws and didn't sugarcoat the rights and wrongs of history. That's why polish will always help more than hurt. Polish, to me, means that all involved put in the proper effort to convey their art and craft to perfection. Best of all, the result is nearly always approachable and entertaining thanks to the efforts to streamline large ideas. Call it populist, but I wish more movies took that level of care and consideration into their filmmaking. The end result is simply masterful for "The Imitation Game." Direction is pitch-perfect and the artistic details are exquisite, from the use of the actual Bletchley Park locations to the costumes, cinematography, and stirring musical score from Alexandre Desplat. Matching the "Oscar bait" blueprint, the ensemble cast carries zero weak links. Mark Strong finally gets a plum part away from being a stock villain with a good voice. Charles Dance channels his "Game of Thrones" power into the right place as the pushy superior without being a caricature. Closer to the top of the card, this is easily the most invested and serious work from Kiera Knightley in a while and Matthew Goode's smoothness will always garner your attention. The real gem is the lead. By far, the most exquisite part of all is Benedict Cumberbatch's lead performance as Alan Turing. We've seen glimpses of what Cumberbatch can do in meaty and choice supporting roles for years, playing both hero and villain. He ascends to another level with his ability and talent in this overflowing lead performance. He conveys immense intensity and intelligence with the exterior aspects of Alan Turing and then tops all of that with the powerful emotion, focus, and motivation of the internal side of Alan Turing. This is masterful work from an acting genius on par with the real-life genius he's playing. Zero complaints will be made by me if he walks off the Oscar stage with a Best Actor trophy after this film. Just as intended, "The Imitation Game" will be a multiple Oscar nominee in many categories large and small this awards season. It has the trend of recent awards history on its side as well. At this year's Toronto International Film Festival, "The Imitation Game" won the People's Choice Award for Best Film. Three of the last six films to earn that distinction ("Slumdog Millionaire," "The King's Speech," and "12 Years a Slave") went on to win the Academy Award for Best Picture. Call out the "Oscar bait" planning and intentional polish all you want, but you won't be seeing a bad film whatsoever. You will be seeing a calculated crowd pleaser with perfect delivery, through and through. In the end, if the votes side this way, the Academy won't be naming a film it will regret should "The Imitation Game" win it all next February. This is choice they can be proud of. LESSON #1: MARRIAGE OF THE MINDS-- When the world rallied during the Second World War, it took everyone doing their part. War efforts come in all shapes, sizes, and disciplines. Each person brought their own contribution. For the scientists, mathematicians, officers, and intellectuals brought to Bletchley Park, they brought their minds and ideas to the war instead of rifles and grenades. This project was their way to help the cause and raised the attention towards math problems being more than games in the big picture. War forces everyone, even the smart people away from the front lines, to put aside differences and work together and combine their efforts towards the central goal. As cocky and self-assured as Alan was, he still needed and found value in the team approach as a loner in a room full of egos. LESSON #2: THINKING DIFFERENTLY-- So many great minds and innovators in our history share this lesson. The people that distinguish their talent and intelligence from the masses are the ones that blaze new trails and think differently than others. When faced with a problem as difficult as the Enigma code and the repetitive failure that continued for years, it was going to take a different approach. Alan saw computation and new engineering where others saw equations and riddles. His creation and theory behind his computation machine was radical thinking. Groundbreaking results come from radical thinking. Just look at how computers have progressed from his innovation, much of which was kept secret for years. More on that next. LESSON #3: KNOWLEDGE CONTROLS EVERY SITUATION-- Brains go over brawn just about every time. Intelligence matters. Go read Sun Tzu and you'll hear the same. In just about every situation of his life, Alan Turing was the smartest man in the room. That put him a step ahead of everyone else. He was in control. More than their fair share of people were equally put off and yet intimidated by his intelligence and presence. Turing clearly preferred it that way and it served him well. LESSON #4: THE RAMIFICATIONS OF BREAKING SECRETS-- The race against years of time and losses pushes the stress of breaking the German Enigma code to the forefront in every attempt from Alan and his team. There's a decisive moment where the question is posed of what happens if they succeed. What will come of breaking the German codes of communication? What will that mean for the war effort and how will the Germans respond? Wanting a secret broken to help others and learn truths is one thing. Knowing how to use that valuable information correctly is another. LESSON #5: THE RAMIFICATIONS OF KEEPING SECRETS-- The ramifications of secrets do not end at breaking them. The consequences and difficulties extend to keeping secrets as well. This lesson speaks to both the intelligence and spy work of this special project and also the personal plight of Alan Turing himself with his homosexuality. If any word on development for cracking the Enigma code got across enemy lines, the Germans could change their codes overnight and kill any progress, making the secrecy of the team's effort essential. Alan's personal secrecy was more difficult in the face of the then-illegal nature of his "gross indecency." Informational secrets are easier to keep than personal ones of the heart.